Description: At Dave & Buster's you can play hundreds of the hottest new arcade games in our Million Dollar Midway and win tickets for epic prizes. Try our mouth-watering, chef-crafted creations in our American restaurant. From wings to steaks, we've got whatever suits your appetite. Our premium sports bar features innovative cocktails, impressive wine selection, and 20+ beers to assure we're stocked to satisfy! Watch your team on one of our massive HDTVs with epic stadium sound that surrounds you from every direction in the sports bar that crushes the competition. Invite all your friends or coworkers for an unforgettable party or event! We work with every size and budget to make planning easy so you can focus on the FUN! Stopped here with a friend for lunch after visiting Bass Pro Shop next door. We enjoyed the Philly Cheese Steak and their Pulled Pork sandwiches, milkshake and iced tea! As it was in the middle of the week, it was not very busy on the restaurant side, and although they have a ton of TVs, the noise level was low enough for us to have a decent conversation! Our bill was $3 before tip. We had to drive about an hour to this place, we have a 6 yo who loves video games so I thought it would be worth a try! We went on a Sunday around lunchtime and it wasn't packed but moderately busy. There were quite a bit of kids running around and a lot of video games that our young son was able to play and have a good time. I'd say you could spend 2 to 4 hours easily, especially if you eat something. The food wasn't as great as I had thought it would have been. I did review the menu before going and my expectations were better quality food items. It is more like standard bar food, I had the Philly cheesesteak and fries plus we had ordered the cantina nachos. Everything seemed too salty for my taste. 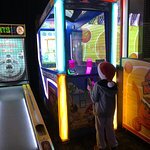 If I had to do it over again, I would have eaten elsewhere and spent the time at D&B just playing the games. It is worth going, but the food just isn't the greatest! The prices weren't too expensive, however! Overall, I would go again. Been to Dave & Buster's? Share your experiences!